Last Thursday was National Cycle to Work Day, an attempt to get more people to discover the benefits – both financial and to their health – of riding to work instead of driving or using public transport. 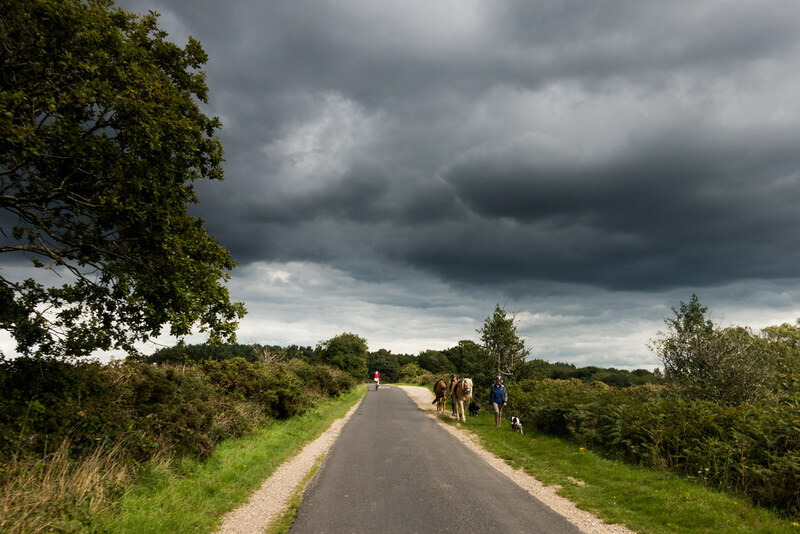 I use a Brompton as part of my daily commute, but last Thursday I rode the full distance into work because I would be taking my bike down to the New Forest afterwards for an early start on Friday. 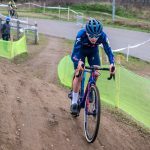 Garmin are co-sponsors of the Cannondale-Garmin World Tour professional cycling team, and suppliers to others including the Pro Continental British team, Madison Genesis. 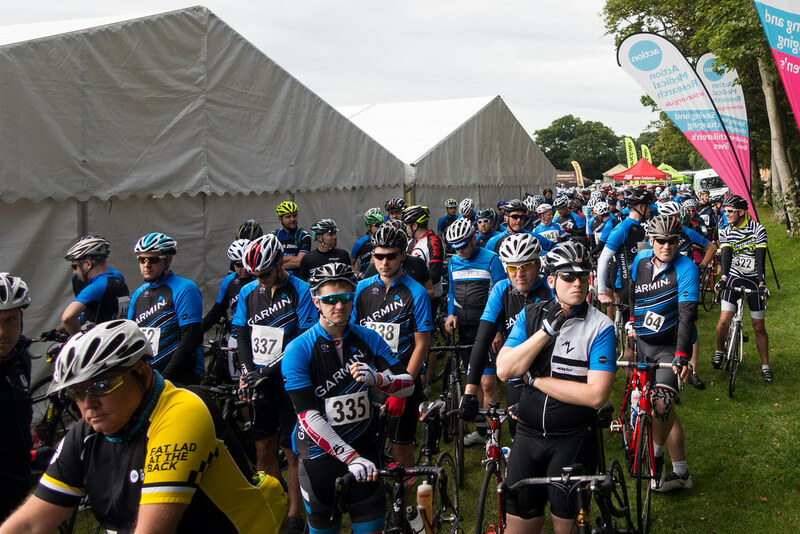 Because I own a Garmin device (more than one in fact), I was invited to apply to join their annual Ride Out – an event where some of the professional cyclists join amateurs for a ‘leisurely’ (ie not at full professional pace) ride. 6,000 applied and I was one of 500 or so riders who got in. But it’d make for an early start on Friday. I calculated that I’d need to leave home at 4am to make the first train down to the New Forest to meet them for an 8am start. Not all of us own cars, and that was a bit too much even for me. So I booked myself into a Premier Inn in nearby Christchurch and planned to ride to the start the following morning from my hotel. After a comfortable train ride down to Christchurch I headed over to the hotel and told the receptionist my name. Did I have my reservation number? This was worrying. Premier Inns are pretty efficient – they want you to spend minimal time with their reception desks to speed the passage of guests in and out. I took out my phone and searched for the confirmation email. I had a horrible fear that there might be a problem. And as I double checked my confirmed, non-refundable, booking dates, I realised that I’d manage to book the following Thursday! This was embarrassing. Yes – she had my booking for the following week. OK, was there anything I could do to pay extra and change my booking. What? Why would a Premier Inn be full on a random Thursday night? She said that there was space in nearby Bournemouth, and there was also a Travelodge nearby as well as a B&B. It was by now gone 9pm. I walked away, mobile phone in hand and instantly brought up the Travelodge site. A few taps later, and I discovered that they were full too. Furthermore, the Premier Inn in Bournemouth had a single room left, and the price had bumped up to £100. Quite a price for a stupid mistake (How I made the mistake I’m not sure, since when making the booking earlier in the week, I’d repeatedly entered the correct dates into a number of sites’ booking engines). Then I opened TripAdvisor. Bournemouth was only ten minutes away by train, and there was a train due. So I hurried to the station and on the platform, via a combination of TripAdvisor and Hotels.com, managed to book myself into a cheaper, and actually very nice looking hotel quite near the station in Bournemouth but tucked away a little. The receptionist instantly found my reservation and had me into a very pleasant room. Not a great start to my ride. The following morning I took the train back from Bournemouth towards the New Milton in the New Forest, where I found another rider heading out to the event. We rode the short distance to the holiday site where the ride was being organised from. There I was quite surprised to discover how large the event was. There was a big field with a large marquee at one end, a series of tents to allow you to register in, and a number of trade stands. A food tent was serving breakfast, and there were some tables and chairs laid out. I duly registered and received an actually pretty smart sponsored jersey and goody bag. 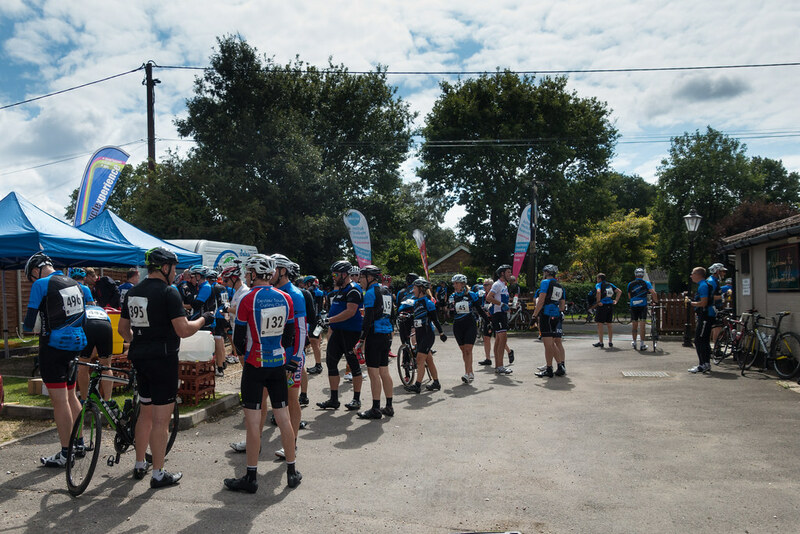 Although there had been a donation to charity (the very worthy Action Medical Research), everything laid on, including the cycling jersey and food was completely free. Then the professional teams arrived. 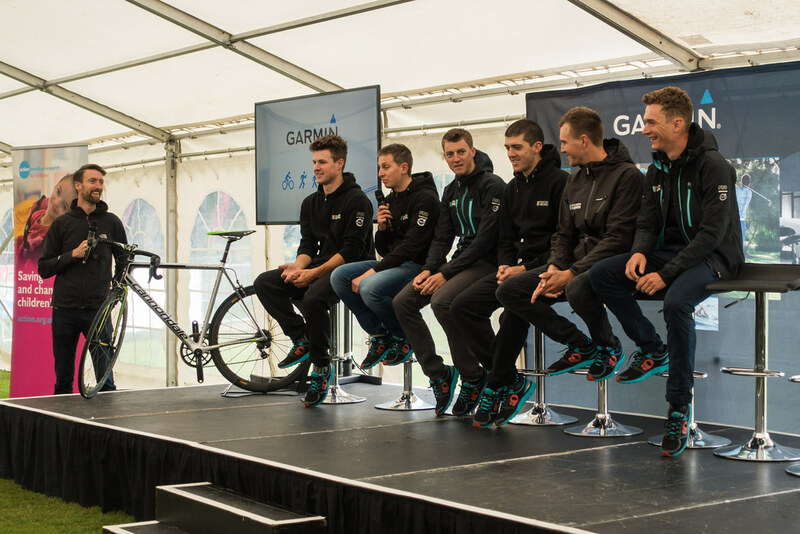 The Tour of Britain was starting in North Wales on Sunday, which explained the timing of this event, but first stop for them was their promotional duties with us. 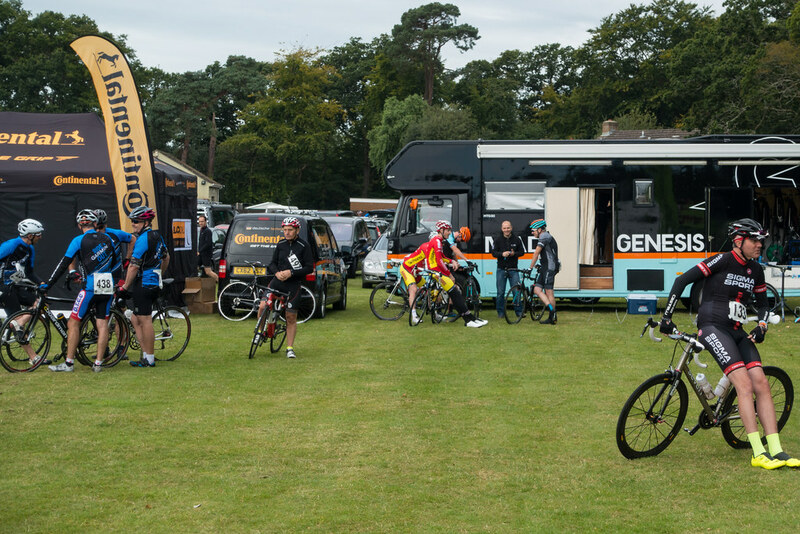 Madison-Genesis had a decent sized vehicle with a rider area towards the front and a kind of portable workshop towards the back. Cannondale-Garmin has a full-sized bus. Although they have a big presence in Spain at the Vuelta, most of the World Tour teams have at least two buses to cater for being in multiple races at the same time. Indeed it’s not uncommon for teams to have representation at three races simultaneously. We gathered in the marquee where Daniel Lloyd was to be master of ceremonies. An ex-pro himself, these days you mostly hear him doing commentary and interview duty on television, and as one part of the really excellent GCN team on YouTube. The GCN guys were there for the Ride Out and I saw them shooting at least one video while they were there. 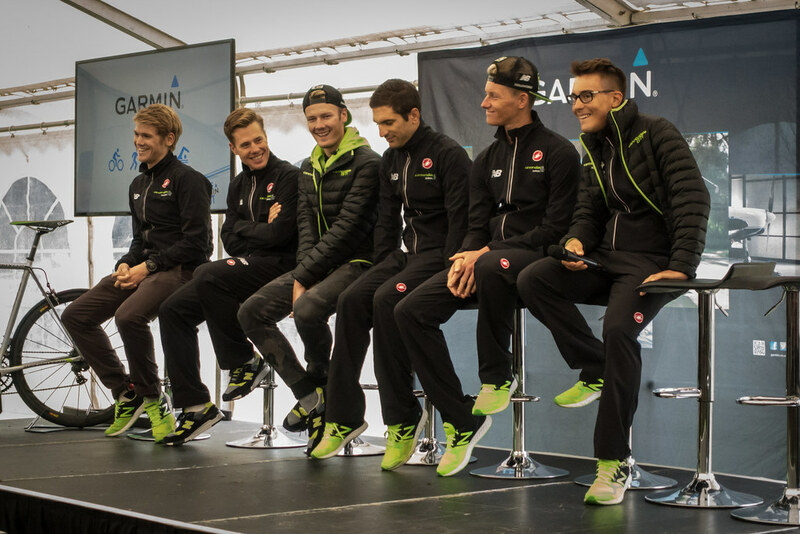 Then we had Q&A sessions with both the Tour of Britain teams who proved decent interviewees. Lloyd was well-prepared and had questions for each of them. Then there was a charity auction. I’d bought a couple of tickets. But I didn’t come away with a new Cannondale bike or anything else in the draw. Finally it was time for the ride. We would be going out in groups, and each group would be accompanied by a couple of riders. The groups weren’t organised by any particular categorisation, and I headed for an earlyish group if only to give myself a decent opportunity to get around the 47 miles without ending too late. At the start I was safely in my group, but the pace was fast for me, and I found myself towards the rear of it. At one point I was dangling off the back a fair bit with a couple of others. I worked hard to get back on, but just after I finally had, a major road intersection got in the way, and I was no longer with the larger group. The group wasn’t a formal train and throughout the event, people were riding at their own pace. As such I wasn’t with a pro rider for any significant amount of time. I later learnt that this wasn’t just the case for me. Lionel Birnie of The Cycling Podcast related how he hadn’t stayed with the pros either. Although I’d applied individually, it was clear that a decent number of others were riding in groups with their clubs. I guess that if a lot of them applied, a handful had got in. But there were solo riders like me as well. It’s one of the issues you face when you join a ride like this that’s been over-subscribed. We’d been told the course was essentially flat, with the only significant hill just before a drinks area about mid-way around the route. But that didn’t take account of some long, quite exposed heathland drags. I found myself slogging through this area, often alone. This was the first ride on my new Ultegra cranks. The Giant Defy 0 I’ve had for a couple of years was mostly an Ultegra groupset, but my cranks and bottom bracket were FSA – I assume to save a bit of money to meet a price-point. Recently however my bottom bracket had been making noises when I put it under force riding up a hill or something. On a sportive in Norfolk this had finally ended with a fatal popping of the bottom bracket that caused me to withdraw completely from the event. I decided that I was going to go fully Ultegra, and with a deal on at Evans on Shimano cranks, I replaced my FSA set with Shimano ones at the same time as replacing the bottom bracket. This was my first big ride on the new combination, and things were going well. 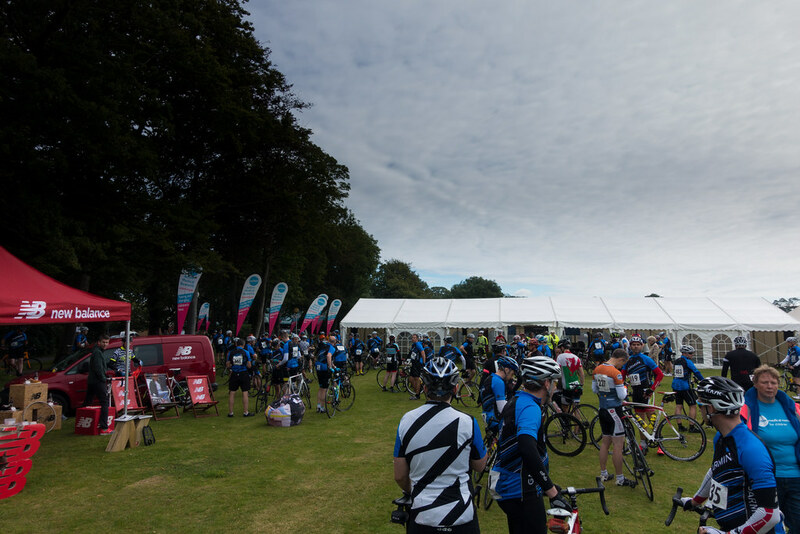 The drinks stop was just beyond halfway and was well-stocked with energy gels, bananas and other treats. I didn’t hang around too long as it was clouding over ominously. Although the app on my phone said we’d get around dry, I wasn’t so sure looking at some of the clouds. So I was keen to get things over quickly if possible. I headed out with a handful of others, and having drafted for a little while behind one guy, I decided to take my turn at the front. Somehow I dropped him though, and so I found myself alone again – or rather separated from others. I headed onwards, and kept up a better speed. Those gels were kicking in. The last part of the ride went fairly quickly and we were soon back at the base where lunch was being served. A good day’s riding, and nice to see a part of the country I’ve managed to never visit my entire life! I headed back to the small local station, aware that the trains back to London were infrequent and only carried six bikes officially. I stood with the bike one stop before we reached Southampton and I found a permanent space. Carrying bikes on trains is always “fun.” Some operators make you book which at least guarantees a spot. But others run on a first-come first-served basis. Fine if you get on at the start of the line, but not so great otherwise. Back in London I heard a guard tell another one that she’d stopped two bikes getting on at one point. It was only 4:30pm in London and my next problem was that I’d not be able to take my bike on a train home until 7pm. I wasn’t going to hang around that long, so even though I had a rucksack full of work clothes and shoes, I rode the 14 miles or so home through London traffic. I chose the less hilly but much busier route home, because I was pretty knackered. I’d managed to the Ride Out at a fast speed for me, and now I was feeling it in my legs. Still, a fun event, and I’ll definitely try to do it again.